Edward Dorchester has invited several families to a ball at his estate, Romero Park, to celebrate the engagement of his ward Sophie. As they come together, the occasion is marred by the undead. 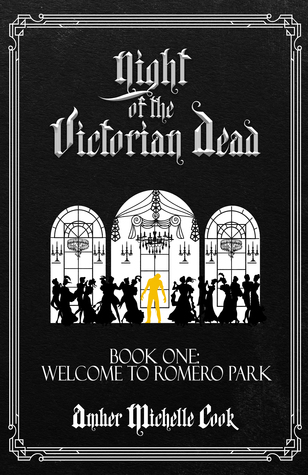 Welcome to Romero Park is actually book one of a series, so we never actually get to see the ball at the estate, even though it's constantly referenced. We are introduced to the entire cast of characters in extensive detail, complete with backstories and flashbacks to show some of the relationships between them. There are hints of the zombies that will eventually overrun Romero Park; the name itself is likely a nod to the classical Night of the Dead director, as is the series title. We have sick tenants on the estate, the stranger that had tried to attack Rosemary, the empty coach with blood on it and a missing family that had been heading to Romero Park. The flow of this novel is very slow, and the flashback sequences in the first half of this book only help to reinforce that. It feels as though this would have been one great horror novel, but had instead been divided up into a series and had to be stretched out and padded as a result. Instead of showing in detail the conversations that had taken place years ago, references to them would have been enough to keep the flow of the story going and continue leading up to the eventual zombie sightings. Instead, the hints we got seemed to ramp up the expectation of an attack that never actually happens. I was rather disappointed by that.